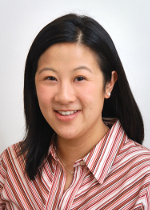 Audrey Calderwood, MD, MS, FASGE from the Boston Medical Center in Boston, Massachusetts, USA discusses her Original Article “Boston Bowel Preparation Scale scores provide a standardized definition of adequate for describing bowel cleanliness” from the August issue. The assessment of bowel cleanliness during colonoscopy (while not a glamorous topic!) is critical to the practice of endoscopy. Endoscopists and patients alike want to know when the level of “prep” is good enough for screening purposes and conversely, when it is so poor that the exam doesn’t “count.” Establishing these thresholds of bowel cleanliness has important implications for missed polyps and cancers as well as utilization of resources, such as unnecessary repeat testing. 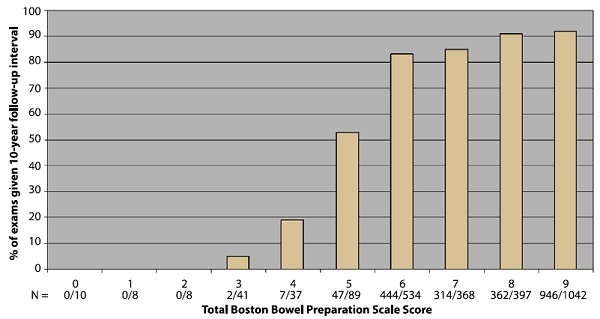 The aim of our study was to test the hypothesis that Boston Bowel Preparation Scale (BBPS) scores correlate well enough with physician behavior (i.e., recommendations for follow-up intervals) that they could be used as standardized definitions of “adequate for a 10-year interval” and “inadequate,” requiring prompt repetition of the colonoscopy. We felt compelled to conduct this study because despite the importance of bowel cleanliness for colonoscopy, at the present time there are no standardized, easily implemented definitions for an “adequate” preparation. Identifying a clear and universally accepted definition of “adequacy” of bowel preparation cleanliness that can be used in clinical practice would help ensure efficient use of colonoscopy resources and improve the capacity of our current system. Figure 3. Percentage of colonoscopy examinations with normal results in which 10-year follow-up was recommended stratified by total Boston Bowel Preparation Scale score. In our study of colonoscopy data from 36 adult gastrointestinal endoscopy practices, we were able to evaluate 2516 normal screening colonoscopies performed by 74 endoscopists. We found that when the BBPS segment score was ≥2 in all three colon segments, 10-year follow-up was recommended in 90% of cases. When total BBPS scores were 0-2, follow-up within one year was recommend in 96% of cases. Exams with total BBPS scores of 3-5 had variable recommendations. We verified these findings among 167 endoscopists in a survey showing 4 standardized colonoscopy videos with pre-established BBPS scores. The BBPS appears to be a reasonable standardized tool for determining if bowel cleanliness is adequate for recommending a 10 year screening interval (total score ≥6 and/or all segment scores ≥2) or inadequate requiring repeat examination within 1 year (total scores ≤2). Future research should determine how to manage intermediate BBPS scores of 3-5.